Does this wedding get good reception? It feels like YEARS since my last column got published. I guess that’s the upside of five-Sunday months though, right? Anyway, I’m in Los Angeles this holiday weekend and, at this very minute, I’m probably three sheets to the wind. 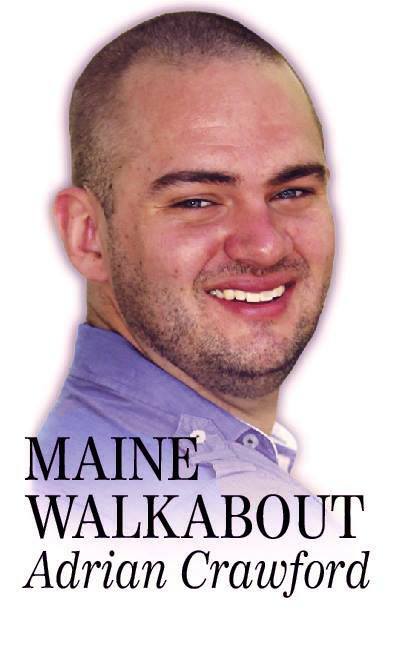 But to prove that I do still have, like, a job and everything, here’s my latest offering for CentralMaine.com. If you’ve been reading this blog for awhile, you’ll probably recognize the middle portion from a post I wrote here a little while back. But I’ve given it some current context, by topping and tailing it with some anecdotes about my dad’s wedding. 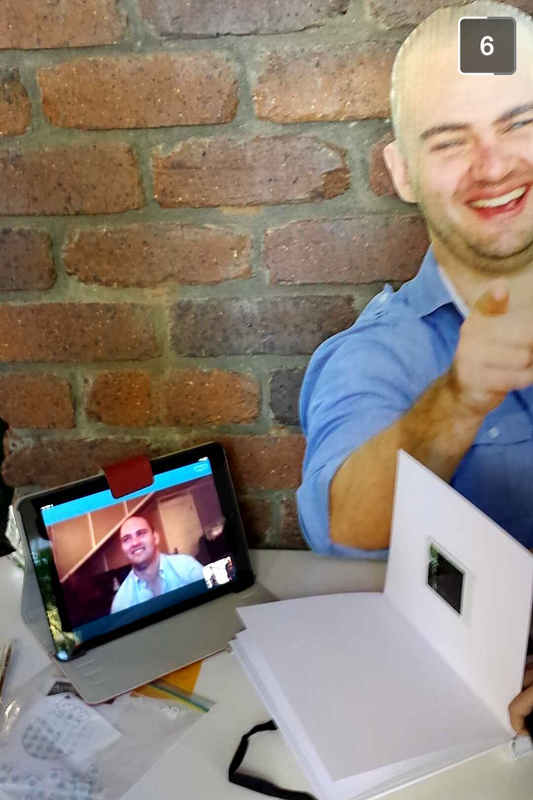 And after the jump there are even a couple of hilarious photos of me as a cardboard cutout. The Internet makes the world a much smaller place, and immigration that little bit easier, writes Adrian Crawford. Last Saturday night, something strange appeared on my TV. Who’s made of cardboard? No YOU are! The quality was kind of shaky, everyone on the screen was dressed as if the weather was cold, even though the sky was a brilliant blue that contrasted with the deep green of palm trees I could see. The voices of the people gathered were real familiar, even though their faces were somewhat obscured by the blurry picture. And most strangely of all, in one shot, I saw myself. Melodramatics aside, the images on my TV were coming live from Australia, from my father’s backyard, where he was rewarding my now-stepmother for a decade of Zen-like patience by tying the knot with her. 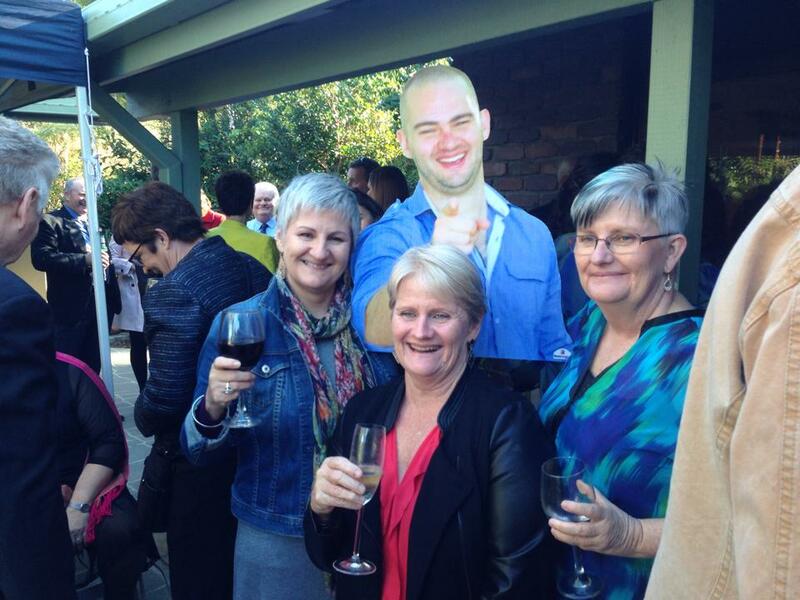 The “myself” that I saw was a life-sized cardboard cut-out that my dad had had printed for the occasion, so I could make an appearance in the family photos if nothing else. Unfortunately, I couldn’t be there in person, for a variety of reasons. Firstly, I couldn’t be much farther from home than I am here in central Maine, literally almost halfway around the world. People ask me all the time how long the flight here was, what the time difference to Australia is, how tough the travel is from Down Under to here. Truthfully, the 13-hour leg from Brisbane to Los Angeles isn’t all that bad. The domestic tuna-can flights from LAX to wherever my final destination is are generally the awful ones. By the time you arrive on the east coast of the U.S. from the east coast of Australia, you’ve done almost 24 hours of travel. Especially if you’re like me and allocated five hours between arriving and your connecting flight, because LAX is the most miserable place on Earth and you don’t want to get jammed up in a 400-person-long security line. So with that in mind, if I’m flying back it’s got to be for a considerable length of time. Due to all that international date line mumbo-jumbo, the flight back from Australia has me arriving the same calendar day I left (sweet, right?). But the journey from Augusta to Brisbane would see me lose a day. If, hypothetically, I was flying home for a Saturday wedding, I’d want to leave on a Wednesday morning (my time) to arrive by Friday (Brisbane time). That would put me in a state of extreme jet lag for the festivities (although you can always drink through that). So, for those not counting along at home (read: everyone), that amounts to about three days’ total travel time. The second hitch is that I’d need to take at least a week off work to accomplish all that. If I left on the hypothetical Wednesday morning, I’d need three vacation days at a minimum just to get me there, and that’s assuming I was back in Maine by Monday to go straight back to work. I’m in the first year of my job here, which means I simply don’t have the luxury of those days off. There in spirit, and also over the internets. Fourth of all (is that a saying? ), and probably the most damning, is the cost. When I lived in Brisbane, I used to spend HOURS on flight websites trawling for sub-$1,000 deals to get me back to the U.S. Nowadays I’m not even brave enough to look at them, due to the crippling blow my savings account took when I moved out here. So I’d go research a hypothetical trip home, just to explain what it would probably cost me for said airfares, but I’m currently in the fetal position crying. For argument’s sake, let’s say it’d be $1,500 to get me there and back. That’s two months’ rent, seven months of car repayments, two years of phone bills … you get the point. Every now and then, I get asked whether I’ve suffered any homesickness since I arrived here, or whether I’m having a hard time without my loved ones back home. Truthfully, though, sometimes I feel like I never left. I’m in contact with my sister and a couple of my closest friends from back home, via text, on a daily basis, and once every couple of weeks I’ll have a “Skype date” with someone from my family, or one of my pals. I can troubleshoot my mother’s computer problems with a few simple emails, if need be. That’s the beauty of the Internet, really. As much as it can be tiresome, an interruption or a social crutch — so says the guy whose entire professional career has been working exclusively for websites — it really does make the world a much smaller place. So while it was tough not to be able to watch on in the flesh as my dad got hitched, watching it on my television was better than not watching it at all. Who says there’s never anything good on TV?